When comic book legend Stan Lee throws a party, everyone wants to attend. And lucky for us, we are all invited! 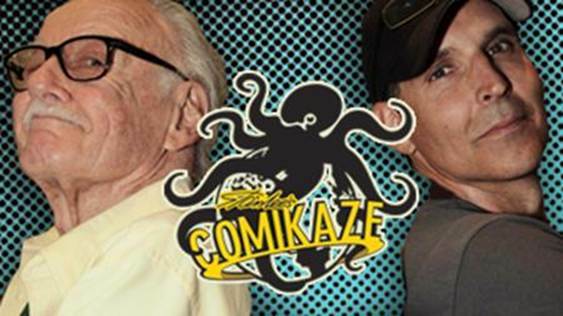 Stan Lee’s Comikaze, Los Angeles' largest pop-culture convention, opens on Saturday, September 15, 2012 at the Los Angeles Convention Center. Stan has invited his old friend, comic superstar, Todd McFarlane, creator of Spawn and the force behind McFarlane Toys to join him. Bring your favorite comic or action figure and get a FREE autograph from Todd. You will NOT want to miss the Todd and Stan panel, the funniest comic book panel on earth. McFarlane has created a special program cover, featuring Stan, which will only be available at the show. You know we are dying to show it to you, but it’s top secret, so you’ll have to wait a little longer. Look for the reveal over on our Facebook and Twitter sites soon. Here’s where you will find Todd and company at the show. Free Spawn comic for the first 75 people. Limited to two autographs per person. Two legends come together to discuss their legacies and the future of entertainment. Joining Todd at the show will be Spawn Creative Team Member Jon Goff (table #1336). Jon Goff currently plots the monthly Spawn comic book with Todd McFarlane, and has launched Contraband Comics as an outlet for a series of creator-owned comic book titles, including Big Hitters, Blindside and Jack Rabbit. Visit Jon’s table for a chance to score some free Spawn comics and McFarlane Toys or to purchase his comics at the show. Follow him on Twitter: @Jonathan_Goff. McFarlane has had many successful artist collaborations over the years, and this year it was with Maxx242 on the best-selling Spawn apparel line for Famous Stars and Straps, and a co-designed Pearl Jam poster that sold out in less than 40 seconds. You’ll find Maxx242 and his team from Fighting 4 Dreams Studios (F4D) at booth #1059, next to McFarlane’s signing area. Maxx242, Jeff Soto and Jason Gallo will all be at the show and they want to meet YOU! These talented artists have worked with some of the top music and artist talent in the industries and also have had their work shown in top international galleries. They’ve even left their mark with some masterpiece street art across the country. The guys will have lots of stickers to giveaway and will have some of their amazing work for sale: artist’s prints, shirts, toys, and zines. We love their work and so will you. Check them out at f4dstudios.com. Stan Lee's Comikaze: LA's largest comic, gaming, sci-fi, fantasy, horror, and pop-culture convention September 15 - 16, 2012, Los Angeles Convention Center. For more information, please visit comikazeexpo.com.